Nothing says arm party better than a stack of well-crafted, ready-to-pile braided bracelets; more so when you know you’ve made them yourself. A simple mix of textures, delicate hues and a subtle splash of metal is all you need to create a perfectly stackable collection of braided bracelets with a chain accent. As illustrated in this post, it’s actually more simple than it looks, you’ll be learning a simple wrapping technique that can you can use to produce a chevron style pattern and another diagonal stitch design. Eileen from Yes Missy has generously shared her tutorial with us so we can pass it on to you all. A big thanks to the lovely Eileen from Yes Missy for sharing this tutorial. Check out the original article here. 6 to 7 inch curb chain, in either gold or silver. At least 2 yards of suede lace. STEP 1: Take 1 yard of suede lace and loop it through the end of the chain. STEP 2: Leave about 12 inches on one side and the remaining longer piece of lace on another. Secure the suede lace securely with a regular knot. STEP 3: Align the shorter piece along the right side of the chain. STEP 4: With the longer piece, start threading the suede lace into each link of the chain and securing the shorter piece of on. STEP 5: Keep going until you reach the end of the chain and secure it with a knot. STEP 1: Follow the standard weaving pattern to start. STEP 2: Next, weave the other side following the opposite direction of how you started. STEP 3: This will create a mirror-image pattern. STEP 2: Next, weave the other side exactly the same way as you did on the first side. 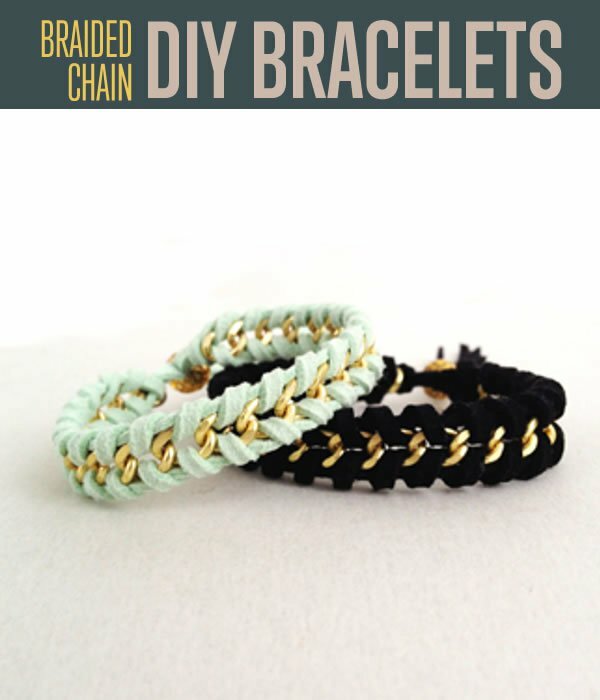 STEP 3: This will create a design that that is exactly like the first half of your bracelet. STEP 4: Once you’ve gone through the entire chain, be sure to secure the suede lace tightly with a knot. Take your bead and loop the strands of suede lace through the hole. TIP: You can use shiny or matte metal chains in gold or silver and mix and match it with your choice of lace–from delicate silk ribbons to more textured suede options or even twine. That’s it. Stack them on your arm or give them away as friendship bracelets for you and your best friends. Click here to check out more from the amazing Eileen at her blog Yes Missy!